Klout team members are in talks with major news labels and media companies to use Klout scores as a way of spreading brand messaging and information, says CEO Joe Fernandez. message is something we found they are interested in and we are interested in. But it is still early days and sometimes for the data obsessive and score weary, a Klout score doesn’t seem to pinpoint exactly where a person stands in the social matrix. We may have all experienced this frustration of looking at the Klout score and wondered, why does it go up one day and then down the next? How can you game it? How can you make it consistently rise? What the hell does it even mean? Fernandez says they are soon going to be making more of that data and the explanation of that data more prevalent on the blog in something called Score Insights. That should be out in early June, says Fernandez. He stressed that the company is spending more money in making this stuff easier to understand. should they care, and how they can access the data. 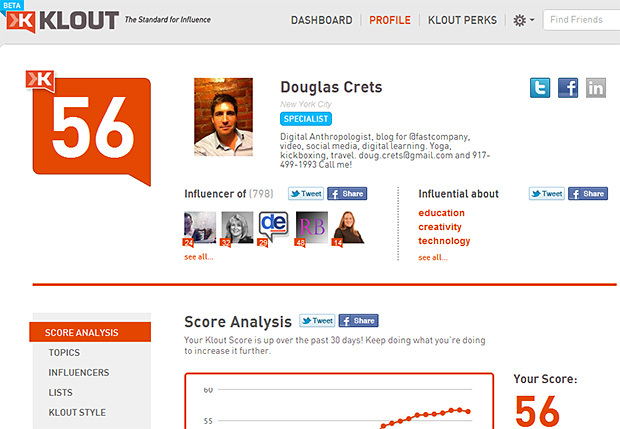 Score Insights should help companies and individuals better determine how they can boost their brands and their Klout scores using the tools available on the web. The algorithm runs on a 30-day open window. If you have a really big day on the tenth of May, by the time that window passes over, you may have not garnered that much attention in subsequent days to keep that score up. So, should a person be at the computer or on his mobile all day pumping out great links? It seems the company is still playing around with exactly how to measure this behind-the-scenes. like. it’s a combination of very data driven and what feels right. comes back to me with data.